Sharks have been fished for thousands of years. In primitive societies, they were caught with wooden or bone hooks for their meat and livers. Their teeth could be used as weapons or tools. Over time, uses have been found for most parts of a shark’s body. The skin can be used for leather for shoes or belts, jaws are taken as souvenirs, the flesh is eaten, the carcass can be used for fertilizers, the fins in soup and shark liver oil is a rich source of Vitamin A and has been used in medicines and cosmetics. 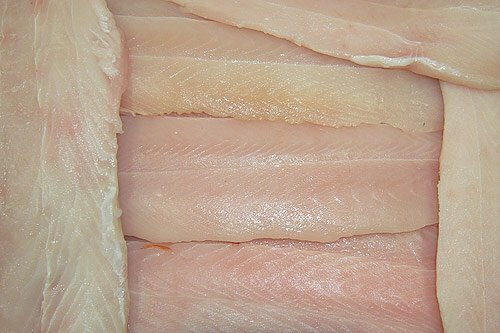 Shark fillets are commonly sold as boneless fillets or flake in Australia. Other names such as rock salmon are used overseas. New Zealand gummy shark (Mustelus lenticulatus) is often sold as rig or lemon fish . Increasing quantities of roughskin dogfishes (which have clean, white flesh) are being sold in Australia. 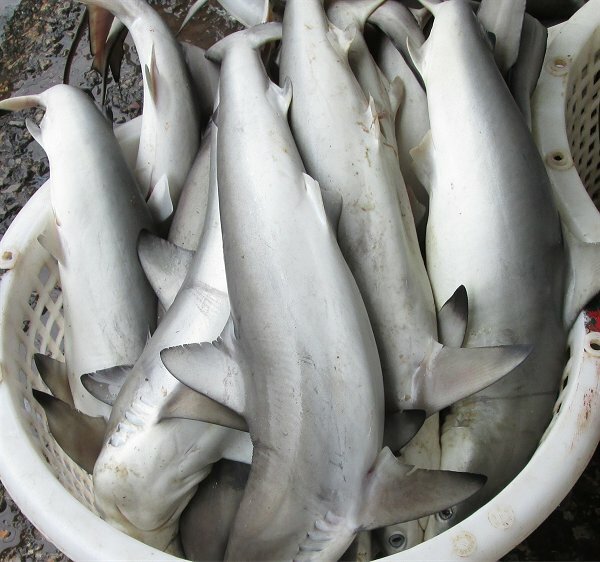 Some shark species are heavily exploited (sometimes wastefully, for their fins only), and the fisheries are strictly managed. Large whaler sharks, tiger sharks and hammerheads are rarely sold due to their strong flavour and high mercury content. Gillnets are the most common fishing gear used in fisheries that are targeting sharks. Gillnets consist of a panel or panels of net held vertically in the water column, either suspended near the surface or near the ocean floor. The mesh size used depends on the species being fished. Small finfish and sharks are able to pass through the meshes. The meshes are designed to entrap the fish around the torso. Large specimens may become entangled in the net or may bounce off. Net panels are usually several hundred metres in length, and a number of panels can be joined in a single set. Nets are usually stored on net reels or drums and are set by placing one end in the water with a counter-weighted flagpole as the vessels steams forward. The drag of the net in the water then pulls the net from the reel until the end of the net is reached. This end remains attached to the vessel. Nets are usually allowed to fish for 2–6 hours. Hauling is the reverse of the setting process, with the catch being removed by hand as the net is wound back on to the reel. long. Baited snoods are attached to the mainline at regular intervals as it is set from a moving vessel. As with gillnets, longlines can be set at various depths in the water column. 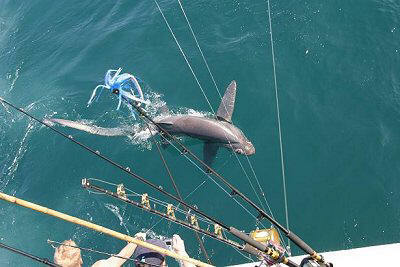 Fishers targeting shark generally set their gear on the ocean floor with anchors to keep the mainline in place. Shark fishers using longlines generally set several hundred hooks at a time. 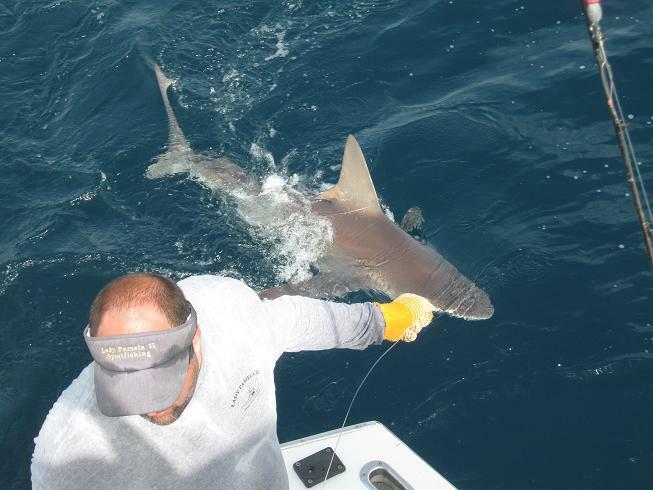 The setting of longlines can be automated, with hooks passing through pre-cut pieces of bait as the line is fed over the vessel’s stern. Longlines targeting pelagic fish such as tunas and billfish are set at pre-determined depth and suspended in the water by buoy lines. Although sharks are often not the target species of pelagic longliners, they are caught in high numbers as bycatch. Trawling is one of the most common commercial fishing methods used in Australia, but fish and prawns are the usual targets rather than shark. Demersal trawls, where the net is towed along the seabed, are used to target species such as orange roughy, gemfish, blue grenadier and redfish in southern Australia. In northern Australia, prawns, sea perch, emperors and rock cod are common target species of demersal trawls. Although sharks are not generally the target of trawling, they can be taken in high numbers. 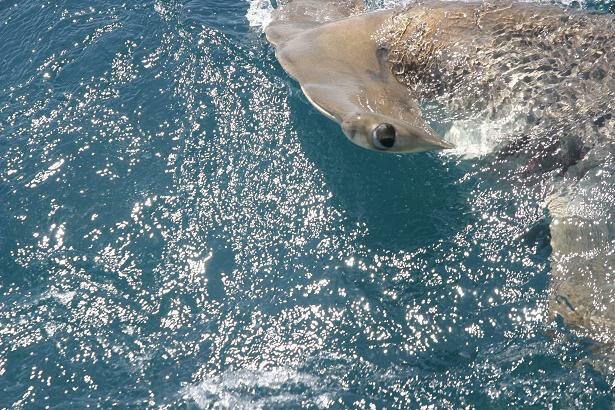 In southern Australia, where some species are managed by quotas that are allocated to individual fishers, quotas have been allocated for the major shark species to allow for the trawl bycatch. 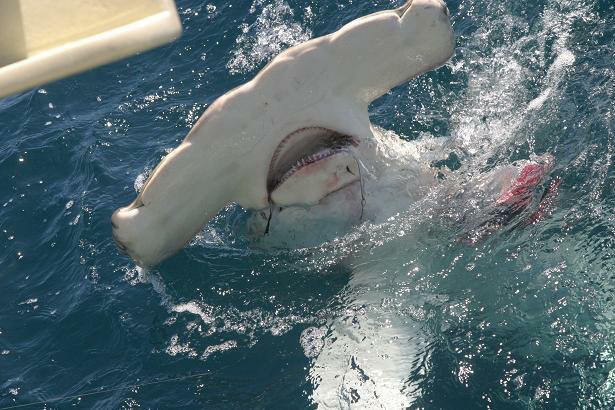 In the Northern Prawn Fishery that operates across northern Australia, sharks have been a major component of the trawl bycatch. This bycatch has been reduced somewhat by the introduction of bycatch reduction devices that allow large species to escape from the net. There has also been a decision by the industry to not retain any shark product in this fishery.